Reports of Tulane's demise may have been greatly exaggerated. Just 8 days ago, facing a 2-5 record and with two league road games on the horizon, Wave fans and the media alike were ready to stick a fork in this one. Oh what a difference a week or so makes, as the Green Wave has come out on the other side with a signature win over a team that entered Ray J with a 7-1 record (and two P5 wins this year) and, in the long view, a credible route to the elusive six win mark. While the Bulls were ranked by Bill Connelly as the #23 offense in the country, the firepower sure felt like it was on the Wave's sidelines, as the offensive line controlled the line of scrimmage and the Wave took advantage time and time again. The final score: Tulane 41 - USF 15. In the end, this matchup would see huge days from Darius Bradwell (135 Yards, 1 TD, 9.0 YPC) and Corey Dauphine (114 Yards, 2 TDs, 7.2 YPC), and both produced explosive runs for their highlight reels. The tandem complemented each other yesterday, with Bradwell's power running producing opportunities once he bowled into the second level, and Dauphine's explosiveness posing a threat all day for the Bulls. Amare Jones, a true freshman running back out of Texas, looked hungry throughout the day in his role as a returner. It feels like it's been a while since we've had a serious threat in our special teams, and Jones has looked liable to break one off nearly every time he touched the ball yesterday (even getting visibly frustrated with a teammate, who called fair catch when Amare wanted the rock). He would cap his day with a late touchdown to extend the Wave's lead even further, making it four Tulane players with a rushing TD. While the Bulls struck first with a field goal (on a 12 play drive that stalled in the red zone), this run from quarterback Justin McMillan, making his second college start, broke things open. The Wave would go up 7-3 and never turn back. Calling a spade a spade here, let's remember that the Tulane Defense was supposed to be bad this year. Not average. Not mediocre. Bad. Yet once again, we're in November, and Jack Curtis's unit has been a foundation for this team while the offensive has worked to find its groove (despite the big plays, the Wave was just 4 for 14 on third downs yesterday). As our friend Collin Sherwin (formerly of the Daily Stampede) pointed out on our FTWCast this week, the interior run game is a critical element of this offense, and the Wave's ability to shut down the run put tremendous pressure on USF throughout the day. In fact, the Bulls entered the game as the #17 rushing offense in the country, averaging 228 yards per game. Instead, they would finish with a meager 110 total team rushing yards, much of which came on a breakout run by quarterback Blake Barnett in the first half. Star running back Jordan Cronkite, echoing Memphis's Darrell Henderson against the Wave, was a non-factor, carrying the ball just six times once the Bulls were down for a total of 13 yards (he's had 120+ five times this season). All of that is even more impressive when you consider that Cam Sample, a key player in this defense, suffered a gruesome looking knee injury due to a suspect cut block (we're still waiting to hear what his status is, but he did not return). Above all, what stands out to me is the impact that the youth movement in this Defense has continued to make. They are flat out getting better on a week-to-week basis, and it showed yesterday, including this forced fumble by sophomore Tirise Barge as USF was putting together one of its few successful drives. Sophomore Jaylon Monroe's lockdown defense in the second half comes to mind as another force late in the game to keep the former 5-star QB at bay. Man, I usually don't roll with the media conspiracy card. I get that LSU and SEC Football move the needle in this state. It's probably crazy in this ad-based journalism world to expect anything remotely like equal coverage. With that being said, I noticed how absurdly quiet it was during the game (shout out to Guerry Smith at The Advocate of course though). Mind you, this wasn't just Tulsa or something... Tulane was beating down a team near the AP Poll Top 25 and inserting itself in the AAC West race. 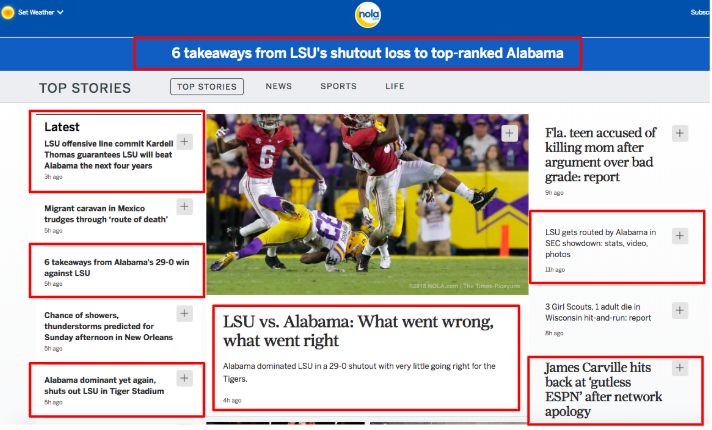 Meanwhile, what a bummer that the local folks chose not let ANYONE know that the Wave was even playing (Exhibit A: we're like 14 hours out at at the time of this writing, and NOLA News' Twitter hasn't mentioned once that the game even happened). Like come on. They lost 29-0. They were a 14 point underdog that didn't come close to covering the spread, with their "best fans in football" in the house and whatnot. They gave up 600 yards of offense to a much better team and did nothing of their own. You really need 7 dang stories to explain to folks that they were a wet fart, full of sound and fury, amounting to nothing? It's one thing when people say no one cares about Tulane because we're bad. It's another thing when you can't allocate a single story to an FBS team with many New Orleans and Louisiana HS players on it breaking through in a big way. End of rant. Tulane advances to Homecoming with a 4-5 record that importantly includes a 3-2 AAC mark. That's the best start for the Wave in league history, as notably our history has mostly been a dumpster rolling off Mike Areso's driveway since joining the conference. 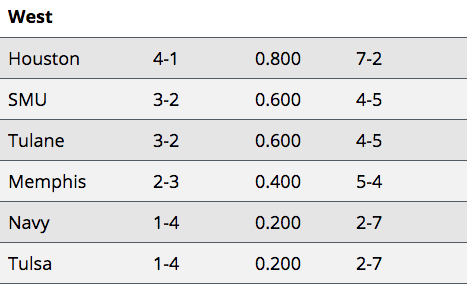 There are now three teams that can win the AAC West. If Houston wins out, they are the West champion. Full stop. Remaining games: Temple, Tulane, @ Memphis. If Tulane wins out, they are the West champion, if SMU loses at least one of its final three games due to the Mustangs controlling the tiebreaker. Yeah, turns out that game could end up mattering a whole lot. Remaining: ECU, @ Houston, Navy for the Trident Trophy. If SMU wins out and Houston loses one or more, they will be the West champion, as the Mustangs now control the tiebreaker with the Wave and the Coogs. Of course, none of that matters for Tulane if they can't get the Homecoming monkey off their backs. I know we're out of Halloween season, but let's get spooky for a minute. Tulane has not won a Homecoming since the last Bowl Wave year in 2013 (beating North Texas). Since then, it's been downright impressive how crappy this shindig has been for us. 2014: Memphis rolls Tulane 38-7. No idea why we thought that was a good idea for HC. 2016: SMU comes back in the 4th quarter to win 35-31. ECU is bad. Tulane should win. But dang, priority #1 is getting this bad juju out of our systems. If they can exorcise those pirate demons next week at Yulman, we'll be in business for a very big opportunity @ Houston. That's the second biggest win in Tulane history in AAC play, and the largest margin of victory on the road. Amare Jones adds exclamation point for #Tulane, which leads USF 41-15. Not even the 1998 perfect team won a conference road game by this many points. All of that is to say... Tulane got its signature win in style. On to Homecoming. Stay Angry, and Beat ECU. Announcers for Georgia vs. Kentucky game just highlighted that Tulane has more SEC championships than Kentucky.